Please join us at the October meeting of the Taskforce on Women and Health. 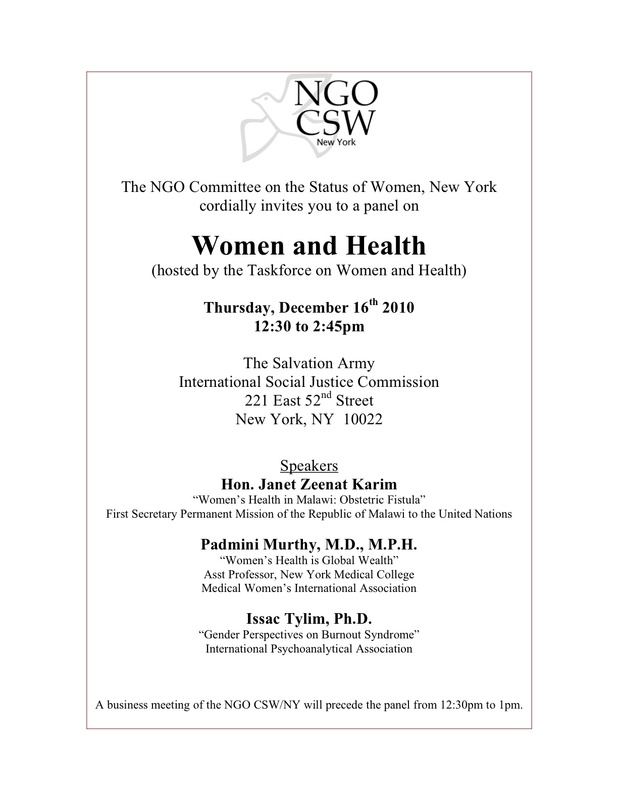 The Taskforce on Women and Health is co-chaired by Padmini Murthy of the Medical Women’s International Association and Isaac Tylim of the International Psychoanalytical Association. This meeting has also been added to the Calendar of Events on the Activities and Events page. A Calendar of Events including CSW 55 Planning Committee Meetings and other Sub-Committee Meetings is now available on the Activities and Events page. Note that the calendar is still subject to change. Before attending an event, please check back on our Activities and Events page or on our website for the most up-to-date version of the Calendar.